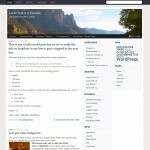 I have decided to release yet another beautiful WordPress Theme for free, for all of you guys. I named it as “Desire” and it is a three column WordPress Theme, with many of the nice features like “threaded comments”. Features like, “Custom Image Header” are only available on themes that I create. Not many theme authors make use of this API given by WordPress. Check it out at the theme page and download it!